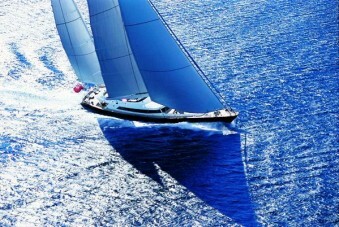 Sailing yacht PARSIFAL III is a superb 54 meter Perini Navi luxury sail boat. 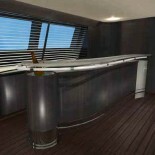 She is available for luxury charters in both the Caribbean & Mediterranean seas. Her stylish sleek lines and a jet-black hull exudes excellence in style whilst she also maintains first rate levels of comfort, practicality and performance. Parsifall III’s lovely aluminium hull, carbon fiber rig, and in furling boom creates powerful sailing performance and a superb sailing experience. Parsifal he is thought to be one of Perini Navi’s quickest sailing yachts built so far. She was constructed in the well known Pendennis shipbuilding yard. Her dark hull creates a sticking image against the brilliant white of her superstructure. 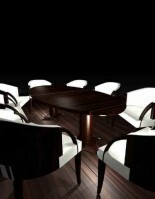 Luxury sailing yacht Parsifal III also has a striking and upbeat interior as designed by the world famous Remi Tessier. Her magnificent interior design is highlighted with the blending of dark ebony woodwork, light sycamore wood, stainless steel, and fine leathers. She features exquisite design and craftsmanship which creates an ultra modern and stylish yet warm, inviting and relaxed feeling, as made possible with the intelligent use of natural and restful textures. The large sailing yacht features a plunge pool, an array of sunning excellent entertainment areas, a Japanese Teppinyaki style Barbeque, and modular type seating in her saloon. Parsifal III is one of the most sought after sailing yachts on the charter market due to not only her grace but also her vast array of practical features. Luxury sailing yacht Parsifal III offers the following recreation amenities and 'toys': two 23 foot Tenders, a 16 foot guest Tender, two Sea Doo Wave runners jet skis with 215h.p. engines and a Kawasaki 800cc Jet ski, six sets of Scuba Diving Equipment, a towable Banana, Donut and Water skis as well as a Wake board. Parsifal’s internal entertainment includes a Japanese style Teppanyaki Barbeque on the yacht’s main aft deck, a Charcoal style Barbeque on the Fly Bridge, a Plunge pool Spa Pool, and a Hydraulic Swimming platform. The yachts Electronics and Communications include a Wireless connection for laptops through out and wireless email and GSM and SATCOM. Her electronics are a SAT TV, a High Definition TV & DVD in the main saloon as well as all cabins including a DVD Library (10,000 films), and a B&O Hi-Fi Sound System.